Clearly the first week of 2017 is all about easy meals for me. I wish I could say that I’m doing it all for you. I am, of course, but I’m also being ridiculously selfish and doing it for me, because I’m in the midst of photographing my cookbook and need meals that don’t require… well… cooking. See also: this is Eddie’s worst nightmare on toast. He doesn’t like avocado and he has a weird aversion to cucumbers. I gave him a chicken thigh! He was happy. I know that I just recently shared my favorite winter avocado toast, but this here is another version that I came across over the holiday season and I’ve been eating it like a crazy person. It is SO good. The idea reminds me of last winter when I couldn’t stop eating sesame cucumbers with everything – especially my veggie cream cheese and smoked salmon toasts. This is similar but a million times better because it’s basic avocado toast and listen… for me, avocado toast is going precisely nowhere in 2017. I mean, nowhere but my MOUTH. It’s my breakfast or lunch staple because it keeps me full in the most perfect way possible. So satisfying and flavorful and crunchy and creamy. Plus, I can add all sorts of stuff to trash it up! ALSO. These are real vegetables. Like actual vegetables on top of my avocado toast. REAL GREEN VEG. What have I done with myself. You make these adorable little cucumber ribbons with your veggie peeler (super simple) and then whip up a quick dressing to drizzle on top. You can even add a little of this dressing to the avocado if you wish – I’ve been weirdly obsessed with sesame and avocado flavors for a while (sesame guac on short ribs tacos? HELLO) so I think it’s fantastic. If it freaks you out, just do your regular salt and pepper routine and throw your cucumber on top! My favorite, we’re talking absolute FAVE part of the whole thing is the sesame sprinkle on top. I added a bit of furikake seasoning too because I have it on hand and it gives a little crunch crunch crunch. AND the chili garlic paste. I love that stuff. It’s so strong that when you remove the lid, it hits you in the face like a huge garlic punch. But it’s so delicious. As long as you’re not making out with anyone. Now is it too early in 2017 to have an ice cream cone after this? Maybe a peanut butter dipped spoon covered in chocolate chips? The vegetables are making me ask. Toast the bread to your liking. Season the avocado with the salt and pepper, either slicing it or mashing it – again, to your liking. Mash or place it on your toast. Slice the ends off of the cucumber and peel it. Use a vegetable peeler to slice long ribbons from the cucumber. If your short on time or anti-ribbon, you can slice it too! Whisk together the vinegar, soy sauce and sesame oil. You can either toss the cucumber in it, or drizzle it over top. Place the cucumbers on top of the avocado and add any extra dressing drizzled on top. Top with the sesame seeds and furikake seasoning. Add some chili garlic paste if you’re into spicy! You got me hooked on this combo last year..need to try it with the chili garlic sauce!! I never thought of adding cucumber to my about toast. Jessica you are a genius and it’s never to early for ice cream or margaritas! i adore kimchi on avocado toast!!! so freaking good. I remember reading over the summer that “sweet potato toast was the new avocado toast” and, while I couldn’t believe that was an actual headline, I completely disagreed. This is case in point why not! This looks delicious (and I can’t see it tasting the same on a sweet potato). Now I’m all curious on what I can use furikake seasoning with. This sounds incredible! 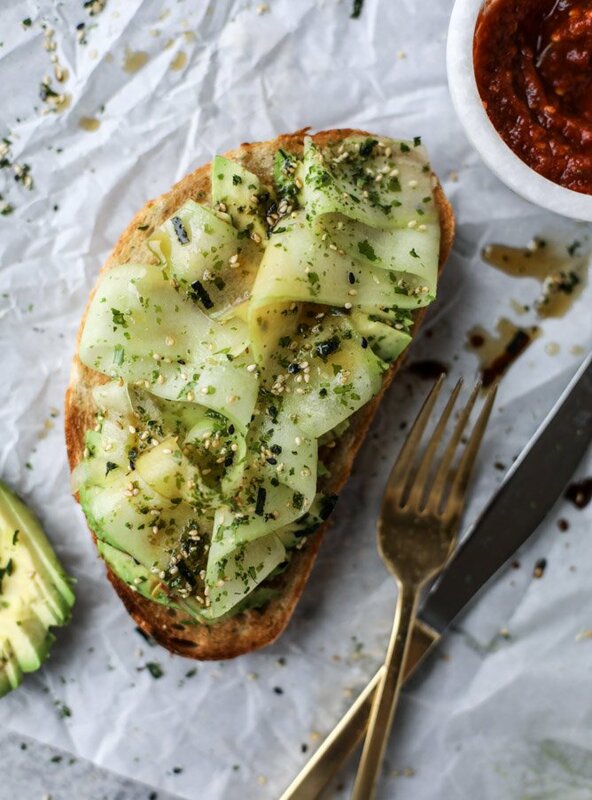 What a delish way to switch up avo toast! i know right! eddie reallllly can’t stand them. Furikake seasoning is addictive!!! There are several flavors of that same brand at my local Asian market (Oceanic in Tampa). It’s amazing on rice and noodles and salad and popcorn(!) and no doubt this toast. omg it is SO good! i’ve even been eating it on soup and it’s outstanding. This looks like the prettiest breakfast I’ve ever seen! so sick of ‘fancy avocado toast’ on blogs; it’s bread with avocado smashed on it and a few other things to make it seem like a recipe. You could have made the quick pickles the recipe, but instead you tried to get all the pinterest likes and made ‘avocado toast’ with stuff added to it. This is why I am enjoying your blog less and less all the time. OMG. Love you so much!! Responding to such a snarky comment with so much class makes me respect you even more. <3 Can't freaking wait for your next cookbook. Yummm! This looks and sounds amazing! This looks delicious! I have been failing at getting quality avocados lately. I get them home & they are terrible. I like the avocado toast “recipes” because I enjoy the inspiration! I’m not nearly as creative with simple things like that…for instance, the bbq shrimp on avocado toast you shared here a few months ago…I’d have never thought of that and it’s now one of my favorite go to’s!